We’d love your help. Let us know what’s wrong with this preview of Mama Miti by Donna Jo Napoli. To ask other readers questions about Mama Miti, please sign up. A beautiful story describing the Green Belt Movement started in Kenya by Wangari Muta Maathai who was the first African woman to win the Nobel Peace Prize (2004) for working to revitalize a deforested Kenya. While the movement was a grassroots movement organized by this woman politician, this picture book tells the story as if Wangari is a town elder who gives advice to women who travel from all over the country for her help. It captures the spirit of the African culture--specifically the Kenyan A beautiful story describing the Green Belt Movement started in Kenya by Wangari Muta Maathai who was the first African woman to win the Nobel Peace Prize (2004) for working to revitalize a deforested Kenya. While the movement was a grassroots movement organized by this woman politician, this picture book tells the story as if Wangari is a town elder who gives advice to women who travel from all over the country for her help. It captures the spirit of the African culture--specifically the Kenyan notion of harambee (swahili) which means pulling together for the common good--as this one woman encourages her people to reengage with the land and respect the symbiotic nature of trees. She becomes known as "Mama Miti" or "mother of the trees." In the back of the book, there is an afterowrd, extensive note from the author, glossary, and a note from the illustrator which discuss the true life of Wangari and the creation of this book. 1) This inspiring non-fiction picture book is about Wangari Maathai, the Kenyan political activist who founded the Green Belt Movement in 1977. She in empowered rural women who had started reporting their streams were drying up, their food supply was diminishing and the animals were dying. Maathai's movement revived the country and brought it back to life. Wangari was an educated woman whose efforts pulled together Kenya for the common good and her efforts for peace and change won her the Novel 1) This inspiring non-fiction picture book is about Wangari Maathai, the Kenyan political activist who founded the Green Belt Movement in 1977. She in empowered rural women who had started reporting their streams were drying up, their food supply was diminishing and the animals were dying. Maathai's movement revived the country and brought it back to life. Wangari was an educated woman whose efforts pulled together Kenya for the common good and her efforts for peace and change won her the Novel Peace Prize in 2004. This poses a perfect Text to World situation as Mama Miti has done for Africa what Earth Day has done for American and our world. A possible Text to Text selection for Mama Miti could be "Fancy Nancy: Every Day Is Earth Day (I Can Read Book 1) by Nancy O'Connor. When Nancy learns that her teachers's motto is "Every day is Earth Day," Nancy tries to convert her parents to do everything the "green way." Little Nancy's theory is that when we all do our part to reduce, reuse and recycle, we can all help protect our planet for many years to come. The first Earth Day was founded in 1970 just seven years prior to Wangari Maathai winning the Nobel Peace Prize for teaching the people of Africa the ancient wisdom of peace with nature. 2) Through this book, Mama Miti exposes children to the land of Kenya and the way of life during troubled times. Young Wangari was told stories of how Kenya was lush and beautiful prior to the sun shining brightly and the drought that resulted. Children who read this book, learn how one woman's idea can change a whole country. Remembering stories of the sacred fig tree and how it brought peace between the angry men, Wangari grew older, remember these beginnings, planted, and gave plants away for families do the same. Her efforts created a movement in Africa and that allowed the country to thrive and become at peace again. The message to young girls and boys everywhere is that even ONE person can affect change. 1 - Creating: What do you think would have happened if Wangari did not give trees away to women and their children? 2 - Analyzing: Compare how trees became a sign of peace? 3- Understanding: Explain why you think Wangari gave trees to others to plant? 4 - Evaluate: what influence does Wangari Maathai (the mother of trees) have on us? 5 - Remembering: - Why did Wangari learn to love and respect trees? I didn't like Kadir Nelson's illustrations in this book as much as I've liked his illustrations for other books. However, the text was beautiful. Napoli worked in all the functions that trees have for humans as solutions to problems that women brought to her. Well done! The picture of Wangari as a child with the tadpoles is taken right out of her autobiography, Unbowed. Napoli also linked planting the trees with peace, although the message toward the end that Kenya was at peace wasn't true for a I didn't like Kadir Nelson's illustrations in this book as much as I've liked his illustrations for other books. However, the text was beautiful. Well, this is the fourth or fifth picture book I’ve read about Wangari Maathai. I still haven’t read her autobiography or her book about the Green Belt Movement. Each picture book has its strengths and weaknesses. This was not my favorite of the books. Its main weakness (for me) was that in the main part of the story, women come to Maathai with problems and each time she tells them to plant trees and explains how the trees will solve their problems. Each time she ends with saying “Thayu numba _ P Well, this is the fourth or fifth picture book I’ve read about Wangari Maathai. I still haven’t read her autobiography or her book about the Green Belt Movement. This was not my favorite of the books. Its main weakness (for me) was that in the main part of the story, women come to Maathai with problems and each time she tells them to plant trees and explains how the trees will solve their problems. Each time she ends with saying “Thayu numba _ Peace, my people” but that’s it. The refrain makes for a good story time read aloud book, but it’s not until the notes at the end of the book (Afterword, Kikuyu Glossary, A Note from the Author, A Note from the Illustrator) that the reader learns anything significant about this important woman. If I hadn’t read any of the other books about her, I might have enjoyed this book more than I did. At least the last page of the story did reveal how she changed the country tree by tree and the green belt movement is sort of mentioned. The notes at the end do give information about her education and what she accomplished. While I also didn’t like the illustrations as much as in a couple of the other books, I appreciated that the illustrator used printed fabrics as one of the materials to create them. I love the brightly colored prints of so many African fabrics and they were captured well within this book. For all that, I did enjoy the book quite a bit. Ideally, all picture books about Maathai would be available to be viewed and read at about the same time because they all offer something a bit different, and readers will get a more complete picture of this woman, the Green Belt Movement, and history if all are read. Kadir Nelson's illustrations are gorgeous and it is worth flipping through this book just to drool over his paintings. The text, unfortunately, leaves much to be desired. While Donna Jo Napoli's prose is poetic, Mama Miiti reads more like a hagiography than a biography. Napoli reduces Wangari Maathai's highly political story to a heart-warming tale of one wise woman helping the poor village women who come to her beseeching aid. Mama Miti does not mention Wangari Maathai's university education, Kadir Nelson's illustrations are gorgeous and it is worth flipping through this book just to drool over his paintings. The text, unfortunately, leaves much to be desired. While Donna Jo Napoli's prose is poetic, Mama Miiti reads more like a hagiography than a biography. Napoli reduces Wangari Maathai's highly political story to a heart-warming tale of one wise woman helping the poor village women who come to her beseeching aid. This is a well researched book with beautifully written prose focusing on the later part of Wangari's life. The illustrations are absolutely stunning and are reason enough to include this book in a collection. The combination of printed fabrics and oil paints give each picture such incredible texture and life. I absolutely love this book. It is a beautiful story of a strong African woman. It has big, beautiful pictures that students would enjoy. It also includes many words and phrases in Swahili, as well as a glossary in the back. A great way to introduce Kenyan culture into your classroom and to link to students from Kenya to help them feel validated. I've read three books about Wangari Maathai and each took a different angle. I like this one better than Seeds of Change and Wangari's Trees of Peace. Mama Miti tells the story of Wangari Muta Maathai, who just died on September 25, 2011. She was a Nobel Peace Laureate - the first African women to win the Nobel peace prize. In awarding Maathai the Nobel peace prize in 2004, the Nobel committee said that her "unique forms of action have contributed to drawing attention to political oppression – nationally and internationally." Maathai was the first woman in east and central Africa to obtain a PhD. She was also the first woman professor the Univ Mama Miti tells the story of Wangari Muta Maathai, who just died on September 25, 2011. She was a Nobel Peace Laureate - the first African women to win the Nobel peace prize. In awarding Maathai the Nobel peace prize in 2004, the Nobel committee said that her "unique forms of action have contributed to drawing attention to political oppression – nationally and internationally." Maathai was the first woman in east and central Africa to obtain a PhD. She was also the first woman professor the University of Nairobi, where she taught veterinary medicine and eventually became head of the faculty. While serving on the National Council of Women of Kenya, she became dedicated to helping with the struggles of women in rural Kenya. Noticing how the rapid environmental degradation was affecting women's lives, she encouraged them to plant trees to ensure future supplies of firewood and to protect water sources and crops. To that end, she founded the Green Belt Movement in 1977, which led to the planting of more than thirty million trees. Maathai's agenda widened as she joined efforts to stop powerful politicians grabbing land, especially forests. This brought her into conflict with the authorities, and she was beaten and arrested numerous times. Her bravery and defiance made her a hero in Kenya. Napoli’s prose is spare but beautiful, and conveys the struggles of women to survive in a harsh environment. But it is the amazing oil and fabric collage illustrations of Kadir Nelson that make this book exceptional. Bright and beautiful, each one could grace anyone’s wall at home. An Afterword gives the facts of Maathai’s life, a list of further resources, and a glossary of African words and phrases used in the text. Evaluation: This is a book that will inspire all ages. Highly recommended. One woman. One seed. One hope for the future. Thayu nyumba -- Peace, my people. Wangari grew up in the shadow of Mount Kenya listening to the stories about the people and land around her. Though the trees towered over her, she had loved them for as long as she could remember. Wangari planted trees one by one to refresh her spirit. When the women came to her for help with their families, she told them to do the same. Soon the countryside was filled with trees. Kenya was strong once more. Wangari had changed her country, tree by tree. Mama Miti is the story of a woman who worked to change her country one tree at a time. Napoli tells the story of Wangari Maathai as if she was a wise elder. While this works within the story, the fact that she is a well educated woman with a PhD might have been worked into the story to emphasize the importance of education imo. The writing is lyrical. The illustrations by Nelson are mixed collage of paint and printed fabric, layering the clothing & panorama with printed fabrics all on gessoed board. The beautiful images are quite striking and a departure from his previous work. I came across this gem during a search for books illustrated by Kadir Nelson. I was planning a study of his work as my Black History Month theme this year. As usual, Nelson’s illustrations are absolutely amazing. 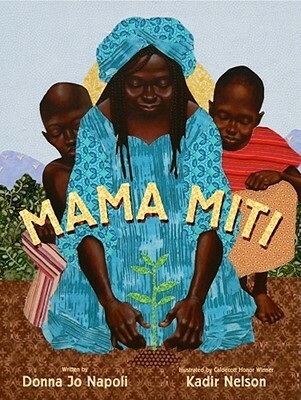 But the story of “Mama Miti” is also a wonderful tale of the work of Wangari Muta Maathai. Wangari Maathai was the first African woman to win the Nobel Peace Prize. Maathai received parts of her education in the US and Germany. As the book states, “she never forgot her roots.” She is Kenyan and started the “Green Belt Movement,” a national grassroots organization fighting the deforestation of Kenya in 1976. Her work calling for a peaceful co-existence between Kenyans and nature landed her in prison in 1991. She was elected to Kenyan’s parliament in 2002 and won the Nobel Peace Prize in 2004. This title was okay but only as a backup of additional info to last year's WAW title Planting the trees of Kenya : the story of Wangari MaathaiPlanting the Trees of Kenya: The Story of Wangari Maathai I thought Planting the Trees of Kenya was better information and had more depth to the story. 1.) Text-to-world connection: A text to world connection I found when reading this book is that something as easy as planting a tree or a plant can provide so much-food/drink/shelter. It is wonderful that the woman in this book, Mama Miti, was able to promote gardening and planting throughout her country. 2.) I feel that this is a culturally specific children's book. The story is a true story about woman, Wangari Maathai (Mama Miti) that lives in Kenya. All of the individuals portrayed in the sto 1.) Text-to-world connection: A text to world connection I found when reading this book is that something as easy as planting a tree or a plant can provide so much-food/drink/shelter. It is wonderful that the woman in this book, Mama Miti, was able to promote gardening and planting throughout her country. 2.) I feel that this is a culturally specific children's book. The story is a true story about woman, Wangari Maathai (Mama Miti) that lives in Kenya. All of the individuals portrayed in the story are people of color. The people are wearing clothing customarily warn in Kenya. In addition there are many words used in throughout the book in Kikuyu (Mama Miti's language she speaks in Kenya) and there is a glossary found at the end of the book, detailing what each of the words mean. 3.) Remembering: What are two things that Mama Miti said a tree could provide? Understanding: Can you summarize the story? Applying: How is Kenya similar to America? Analyzing: What motive is there for planting trees? Evaluating: What is your opinion of the story of Mama Miti and why do you feel that way? Creating: What do you predict will happen to all of the new trees planted in Kenya? More stars please! An astounding telling of part of Wangari Muta Maathai's life works, her contribution to individuals within her country, her country as a whole and to all the rest of the world. Planting trees specific to the needs of each individual seeking her wisdom not only helped the poor but re-greened Kenya, brought back the water cycle and is repairing the home we all share, our precious planet. Although other brilliant books have been written about Wangari, here you will find a real in More stars please! An astounding telling of part of Wangari Muta Maathai's life works, her contribution to individuals within her country, her country as a whole and to all the rest of the world. Planting trees specific to the needs of each individual seeking her wisdom not only helped the poor but re-greened Kenya, brought back the water cycle and is repairing the home we all share, our precious planet. Although other brilliant books have been written about Wangari, here you will find a real intimacy created for the reader. Beautifully illustrated, the images will make you feel you are right there, with Mama Miti (mother of trees) and the people who sought her advice. You will feel the global impact as well, the risks Wangari took (being jailed several times) to do what was right and you be nourished by her unstoppable spirit. This juicy yet rich telling can be the foundation for deep discussions with little people and uncover a genuine gratitude for what we have in 'richer' nations and for the undeniably important work of Mama Miti. It might even spark a bit of investigating as to which trees do what. An important book about an important person. Mama Miti is a children's book that explains how one woman changed a nation by restoring ecosystems and how that helped everyday people. Wangari Maathai, the Kenyan activist who became the first woman to will the Nobel Peace Prize for her work with the Green Belt Movement, makes an excellent subject. The oil paintings and collage illustrations by Kadir Nelson are beautiful and striking, they seem to make a faraway world more real to readers, integrating African textiles and motifs. In addition to Mama Miti is a children's book that explains how one woman changed a nation by restoring ecosystems and how that helped everyday people. Wangari Maathai, the Kenyan activist who became the first woman to will the Nobel Peace Prize for her work with the Green Belt Movement, makes an excellent subject. The oil paintings and collage illustrations by Kadir Nelson are beautiful and striking, they seem to make a faraway world more real to readers, integrating African textiles and motifs. Really I would give the illustrations a five and the text a three. Since I can't do that, I went with the average. The text ... seemed a little dry for a picture book. Which is kind of sad, because as it turns out it is quite an important story. I had never heard of her before but after reading some of the "afterword" she seems like a really interesting person who has done amazing things. Kadir Nelson's artwork is very different in this one compared to some of his others but I still LOVED it. The Really I would give the illustrations a five and the text a three. Since I can't do that, I went with the average. Kadir Nelson's artwork is very different in this one compared to some of his others but I still LOVED it. The different textures just really made different parts of the pictures stand out. That's what Wangari Maathai said to the first women who approached her about having "too little food", no job, and no skills. Maathai told her to plant a mubiru mubiru tree and to eat the berries. Another woman approached Maathai, telling her she had to walk hours to find firewood. "What can I do?" "Plant a tree. Here are the seedling of the mukinduri. This tree makes good firewood. Plant as many as you can." And so it was with Maathai, suggesting various trees to help clean the wat "Plant a tree." And so it was with Maathai, suggesting various trees to help clean the watch, to help the health of livestock, to help keep predators away. Before long, there was "a green belt of peace" because of Mama Miti, the mother of the trees.